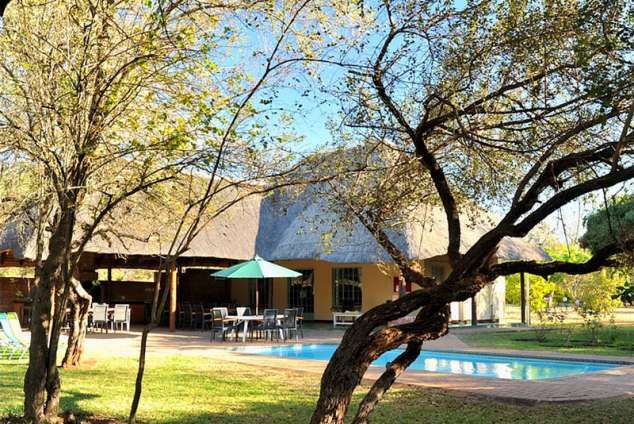 Komati River Chalets - Komatipoort Accommodation. Nestled on the confluence of the Komati and Crocodile Rivers, Komati River Chalets is perfectly placed for those wanting to explore Eastern South Africa, Mozambique and Swaziland. The lodge is situated on the southern border of the world renown Kruger National Park and is the ultimate nature lovers paradise. Kitchenette with full self catering equipment including, table top stove, fridge and Microwave oven Television with M-NET and SABC channels Air-conditioning Braai area in front of each chalet. Breakfast Restaurant Swimming Pool Bar (available only to guests staying at the chalets) Reception (7 am till 10 pm) Mini volley ball, and junior jungle gym, Security fencing and night guard Parking next to your cottage. Over 350 species of birds are found in the area of the Southern Kruger Park. Komati River Chalets is home to all of these species with exceptional waterfowl bird watching. There are Hippopotamus and Crocodiles in the river right in front of your chalets for your viewing pleasure. Smaller mammals species found at Komati River Chalets include, Bushbuck, Duiker, Vervet Monkey's, Thick tailed Bush Babies, Banded Mongoose just to name a few. Opt for either full or half day game drives in the world renown Kruger National Park, Southern Africa's premier big 5 National Park. All day game drives are professionally guided in air-conditioned closed 4x4 vehicles. City Tour of Maputo. Drive along the famous Marginal, the palm lined avenue along the beachfront. View innumerable sights of historical, cultural and scenic beauty, such as the 17th century Portuguese fort, the Catholic Cathedral, The train Station and the war museum. Shop at the central city markets for arts and crafts. Experience the bustle of this vibrant city. Experience Swazi culture at the Motsamu Cultural Village. Stunning scenic drive over the Maguga Dam Wall, catch a glimpse of the Banana leaf dancers Shop at Ngwenya Glass - watch highly skilled glass blowers at work. All items are handmade from recycled glass Visit The Valley of the Kings craft markets Watch skilled locals create hand made candles at Swazi Candles where you may shop for the finished product. 27337 page views since 10 Jul, 2009.